Early in their career, the Indigo Girls frequently performed in The Little Five Points Community Pub, owned by a group of investors led by Don Bender ’64, here with his wife Judy. Though the pub is no longer in business, it helped establish the neighborhood as the funky, eclectic and wildly popular draw it is today and Bender is still involved with the Little Five Points commercial district. ON A BALMY SEPTEMBER AFTERNOON, Don Bender ’64 stands in Findley Plaza on corner of Euclid and Moreland avenues in the Little Five Points neighborhood, holding an architectural rendering of renovation plans. 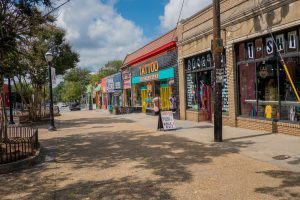 The plaza and surrounding streets – known as L5P – is Atlanta’s best-known bohemian hub, attracting musicians, street artists, venders, theatergoers and browsers to an eclectic neighborhood of clothing, novelty and new age stores, record and book stores, coffeehouses, restaurants and bars. At the moment, however, the triangle is a sleepy place. A delivery man pulls a loaded dolly cart nearby and a store owner jangles his key ring as he prepares to open for another business day. A disheveled man hangs over the railing surrounding a nearby shade tree, and Bender’s wife, Judy, delicately steps around his possessions to touch him lightly on the arm and begin a quiet conversation. A few feet away, Bender points to the future locations of perimeter planters and relocated street lighting. 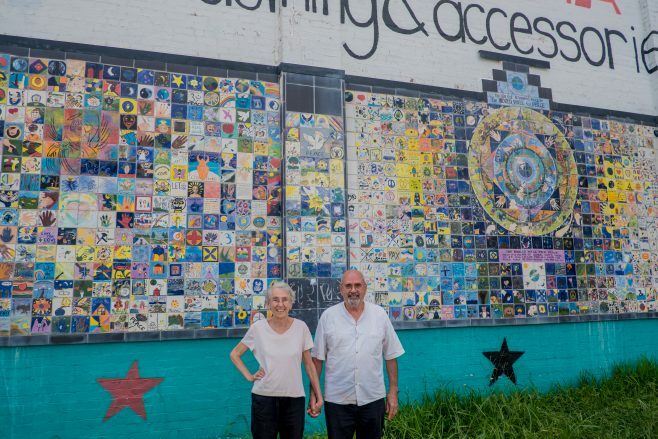 He has known the footprint of this neighborhood since long before its present incarnation, first through his vocational service in Atlanta in the ‘60s and then more fully in the early ‘70s, when he formed a group of investors to purchase and renovate dilapidated buildings. The development effort jumpstarted what is now one of Atlanta’s tourist attractions and a source of civic pride for the surrounding neighborhoods. has synthesized and integrated his life’s many influences. He would name more than five, if you asked him, but he is a gracious soul and knows the limitations of space. “The college served as a kind of halfway house for what I had been and what I was on the road to being,” Bender said. Though some on campus were “voices like those I was trying to escape,” many others shared his progressive thinking. He studied to become a history teacher, but took several social work courses and, most significantly, received his first introduction to the Quaker faith through a campus-wide book selection, The Journal of John Woolman. He also heard Vincent Harding, a black Mennonite pastor then based in Atlanta who was pressing the church toward more active support for the civil rights movement. (Harding would eventually leave the church because his calls to action were, he felt, for the most part not being answered). In 1967, Bender arrived in Atlanta for alternative service at Mennonite House, an interracial voluntary service unit in an African-American neighborhood a few blocks from the Rev. Martin Luther King Jr.’s Ebenezer Baptist Church and the national headquarters of the Southern Christian Leadership Conference. Bender taught in the public schools and contributed to youth programming at the house, but he was also drawn by the civil rights movement to a new faith home. A major organizing center of the ‘60s civil rights movement, Atlanta attracted many with social justice at the forefront of their work – including a group of Franciscan sisters, most of them nurses, from Rochester, Minnesota. Among them was a school teacher, his future wife Judy Harak. The sisters made their home, Bender noted with a grin, on Simpson Road between two strip clubs. Shops in Findley Plaza, a popular gathering place in the Little Five Points commercial district of Atlanta. The plaza is slated for renovations under the guidance of Don Bender ’64 and other community leaders. The young couple lived at Quaker House for the next three years, teaching and contributing to the meeting’s work in civil rights, peace action and draft counseling. Judy would go on to earn her doctorate in biology, teach and direct research at Morehouse College, and then move into a similar position in the graduate school at Clark Atlanta College. Her research focused on microbial mats used in bioremediation, aquaculture and wastewater treatment. When they purchased a home in Candler Park, adjacent to Little Five Points, the family’s sustainability efforts, which included a backyard tilapia farm and cooperative farming, earned attention from Mother Earth News. But that’s another story. Bender’s teaching career would transition as well. He eventually earned a master’s degree in adult education from University of Georgia and would teach ESL and GED prep in a variety of settings, including at a federal penitentiary. 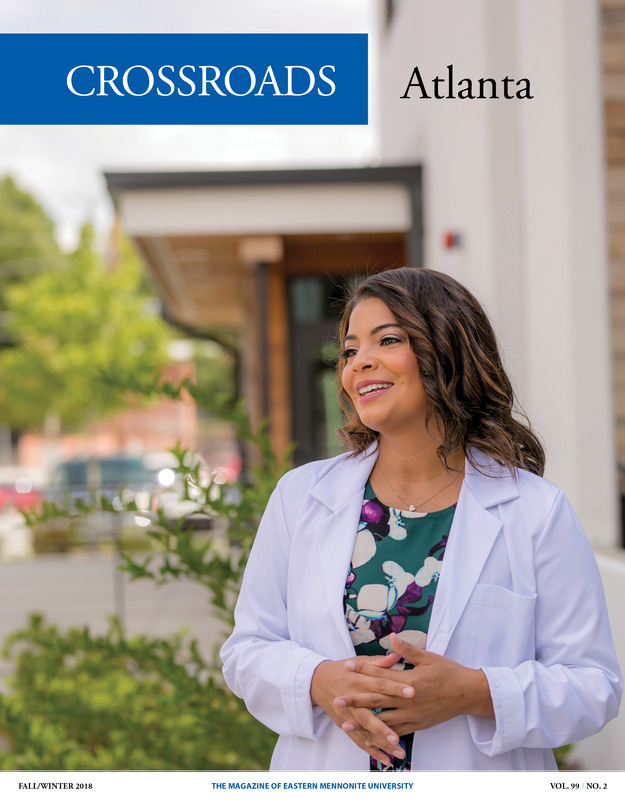 500 Feet East: L5P Community Pub, INC.
Now a homeowner and settled in Atlanta, Bender began to formulate a plan to benefit the languishing adjacent L5P business district. The resulting Atlanta Intown Development Corporation – 17 like-minded investors, all of whom had been involved in civil rights and the peace movement – first renovated six local homes. In 1977, the corporation purchased a strip of storefronts that included the Redwood Lounge, a seedy place that attracted former convicts. It was the nightly site of prostitution, brawls and drug deals – a place that needed to be cleaned up if the neighborhood was to move forward. The Little Five Points Community Pub Inc., ceremonially opened by the newly elected mayor Maynard Jackson, served bar food and alcohol. Bender was pleased when his former EMC ethics professor Harry Lefevre, a new Atlanta resident, became an investor.“I figured that was an endorsement,” he jokes. The space accommodated community meetings and hosted poetry readings, board-game gatherings, art shows and concerts – including early performances by two Emory University students who still call themselves the Indigo Girls. Bender’s contributions to L5P go hand- in-hand with his activist work against the multi-lane Stone Mountain Freeway, a Georgia Department of Transportation plan that twice over a 15-year span threatened the area along with several other historic neighborhoods. First developed in the ‘60s, the plan was vociferously opposed when more than 200 homes were razed in preparation. In 1971, the force of local activism caused then-Governor Jimmy Carter to stop the project, and the land sat for more than a decade until Carter returned to Georgia after his one-term presidency. Looking for a place to build his Carter Center, he reintroduced a slightly improved plan but still with a major limited access highway running through the neighborhoods. Bender lent his organizing skills to city council campaigns, demurred requests to run himself, and attended protests in what became known in city history as the “Road Fight.” Civil disobedience on a wide scale was used to stall the process; Judy recalls running to make sure a bulldozer operator had seen her husband prostrate on the ground. (“I made eye contact with him before I laid down,” Don says.) Eventually the plan was modified: Today’s Freedom Parkway is a gentle four lanes and bike trail, and the former freeway interchange is a large urban park. Now Bender hasn’t used his bartend- ing skills for many years; the group sold the pub after 10 years in business, as “we thought it had done what we set out to do, and other places offering similar things were opening,” he says. But he is still involved in several commercial real estate partnerships and in the Little Five Points Community Improvement District. He is sometimes tapped to share lessons from his experiences with other areas of Atlanta that are still in need of revitalization. When we talked, he was anticipating an interview with a local high school student compiling a history of the area. Bender’s many interests and talents as well as his clear capacity for leadership meant he could have pursued any number of options. How did he decide where to focus his time and energy? As the afternoon moves on and business starts to pick up on the plaza, the Benders head for home, two people walking together through a neighborhood whose transformation is the direct result of their life journeys that were not so much crooked, perhaps, as star-shaped.